The positive benefits of physical activity for physical and mental health are now widely acknowledged, yet levels of physical inactivity continue to increase throughout the developed world. Understanding the psychology of physical activity has therefore become an important concern for scientists, health professionals and policy-makers alike. Psychology of Physical Activity is a comprehensive and in-depth introduction to the fundamentals of exercise psychology, from theories of motivation and adherence to the design of successful interventions for increasing participation. 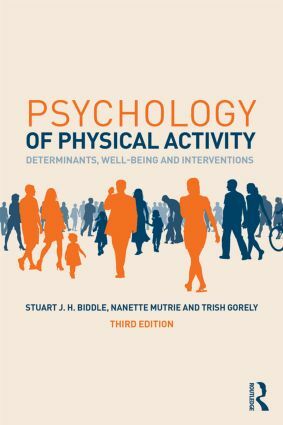 Now in a fully revised, updated and expanded third edition, Psychology of Physical Activity is still the only textbook to offer a full survey of the evidence-base for theory and practice in exercise psychology, and the only textbook that explains how to interpret the quality of the research evidence. With international cases, examples and data included throughout, the book also provides a thoroughly detailed examination of the relationship between physical activity and mental health. A full companion website offers useful features to help students and lecturers get the most out of the book during their course, including multiple-choice revision questions, PowerPoint slides and a test bank of additional learning activities. Psychology of Physical Activity is the most authoritative, engaging and up-to-date introduction to exercise psychology currently available. It is essential reading for all students working in exercise and health sciences. Stuart Biddle is Professor of Active Living and Public Health in the Institute of Sport, Exercise & Active Living at Victoria University, Melbourne, Australia. He was previously Professor at Loughborough University where he was Head of the School of Sport & Exercise Sciences, 2001–2007. He was the inaugural Editor-In-Chief of the journal Psychology of Sport & Exercise and is a Past-President of both the International Society of Behavioral Nutrition and Physical Activity and the European Federation for the Psychology of Sport and Physical Activity (FEPSAC). In 2010 he received the Distinguished Contribution to Sport & Exercise Psychology Award from the British Psychological Society. Stuart has published over 250 research papers and sits on editorial boards of several leading peer-reviewed scientific journals, including Preventive Medicine, International Journal of Behavioral Nutrition and Physical Activity, and Psychology of Sport and Exercise. Nanette Mutrie is Chair of Physical Activity for Health at the University of Edinburgh, Scotland, and she directs the Physical Activity for Health Research Centre there. She is also a visiting Professor at the MRC Social and Public Health Sciences Unit at the University of Glasgow and at the University of Ulster. Nanette is a Chartered Psychologist with the British Psychological Society and has extensive experience of conducting interventions aimed at increasing physical activity. She is also an Honorary Fellow of BASES. She has contributed to policy, for example, ‘Let’s make Scotland more active’, and the National Institute of Health and Clinical Excellence (NICE) programmes on physical activity and the environment and the promotion of walking and cycling (www.nice.org.uk). Nanette was awarded an MBE in the UK New Year’s Honours list 2015 for services to physical activity for health. She gets her own exercise by commuter cycling, dog walking and playing golf (badly, so a lot more walking involved!). Trish Gorely is a Senior Lecturer in Physical Activity and Health in the School of Sport at the University of Stirling, UK. Her research interests are in the psychology of physical activity and health, and understanding physical activity and sedentary behaviour in young people and adults. Trish is an Associate Editor for the International Review of Sport and Exercise Psychology.